Around 1958, Esther McCoy took a photograph of Juan O’Gorman during his visit to Watts Towers in Los Angeles. In the image, the Mexican architect lifts his head to take in the sculptures built by Simon Rodia between 1921 and 1954. Rodia was an Italian immigrant who moved to the United States in 1895 at the age of 15. With no artistic or architectural education, he decided to build a singular construction. With no particular purpose, he built the seven structures that make up the towers (collectively entitled Nuestro Pueblo) using concrete, metal rods, chicken wire, and an endless array of found objects, from ceramic fragments to soda caps. O’Gorman appreciated the work of Rodia as well as that of other builders and artists with similar projects, such as the Frenchman Ferdinand Cheval. The stone coating of his house/studio on San Jerónimo Avenue and many of his “fantastic” paintings are, in part, a tribute to these authors. 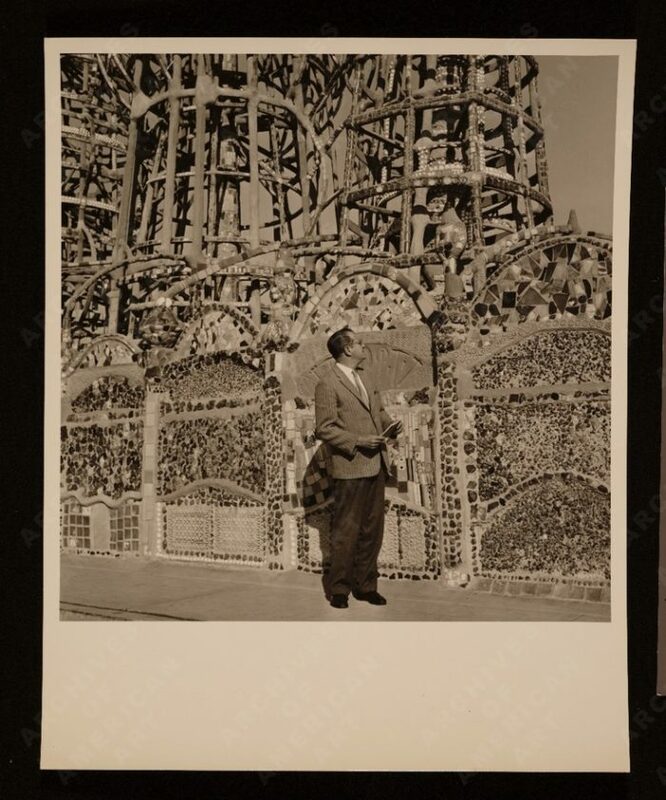 Juan O’Gorman at Watts Towers, circa 1958 / Esther McCoy, photographer. Esther McCoy papers, 1876-1990, bulk, 1938-1989. Archives of American Art, Smithsonian Institution. When O’Gorman visited Watts Towers, Martín Ramírez was also living in California, but confined in a psychiatric hospital. Ramírez was born in Jalisco the same year that Rodia immigrated to the United States. As if following in the Italian’s footsteps, he also crossed the border and settled in Los Angeles. In 1940, while Rodia was still working on his structures, Ramírez was arrested in Pershing Square and interned in the Stockton State Hospital, where he remained until 1948 when he was relocated to the DeWitt State Hospital in Auburn. He lived there until his death in 1963. Recent studies have called into question Ramirez’s diagnosis, which, to some academics, appears to have been a means to confine an undocumented migrant, rather than a legitimate psychological health concern. Encouraged by Tarmo Pasto, a Sacramento State University art and psychology professor, Ramírez spent most of his time in seclusion drawing. At his death, he left behind dozens of drawings with a style that today is recognized as distinctly his own. The exhibition Martín Ramírez. 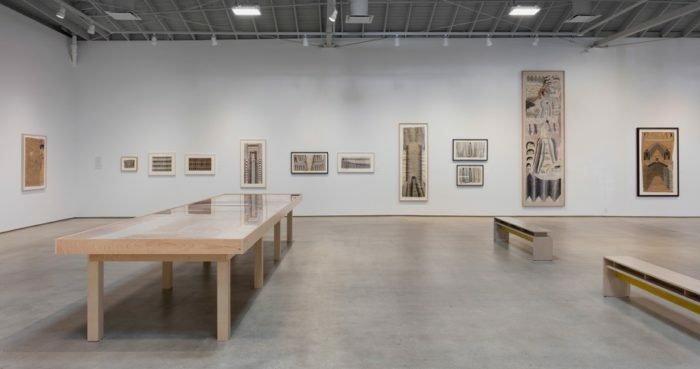 His Life in Pictures, Another Interpretation, on view at the Institute of Contemporary Art, Los Angeles, as part of the Getty Foundation’s initiative Pacific Standard Time: Los Ángeles / Latinoamérica, includes 50 pieces by the Mexican artist. For the exhibition, a six-foot-long drawing Untitled (Scroll) (ca. 1950) was restored and is on view for the first time. The piece, displayed in a large display case, offers a condensed view of the distinct visual characteristics found in the rest of Ramírez’s work in the show. Of particular interest is his method of joining together fragments of different papers to form a unified surface (some functioning as collage) with glue and saliva. This method of assemblage is reminiscent of Rodia’s work, as he also collected and made use of fragments for his towers. 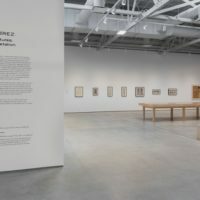 Although Untitled (Scroll) stands out for its great dimension, Ramírez made several large-format works such as Untitled (ca. 1950) of approximately 360 x 100 cm and on display, or Untitled No. 79 (Arches) (ca. 1960-63) 183 x 61 cm. In his essay for the exhibition catalog, James Oles addresses ways Martín Ramírez’s biography impacts our perception of his work. If Ramírez had developed his practice in Mexico, for example, his work wouldn’t be understood today in the same way. 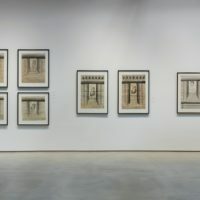 His autodidactic production would be seen – if fortune had smiled upon him and given visibility to his work – as an expression of innate creativity, as occurred with the work of Mardonio Magaña or other masters of folk art in the post-revolutionary era. Something similar would have occurred if he were an American citizen, since in the United States there was a strong institutional appreciation for naïve and folk art at the time, as demonstrated by the popularity of Morris Hirshfield and the 1939 MoMA exhibition Contemporary Unknown American Painters. If Ramírez, as a migrant worker, had crossed paths in California with the likes of José Clemente Orozco, as happened to José Chávez Morado, perhaps he could have matriculated at a university, studied art, and returned to Mexico as a formally trained artist. 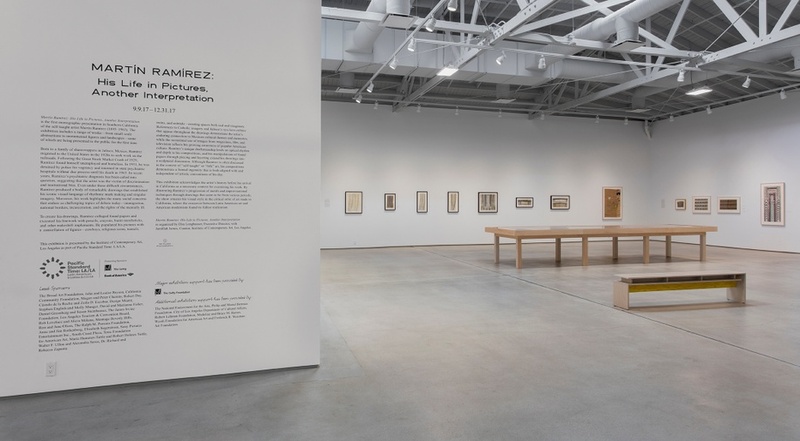 If O’Gorman had discovered his work, perhaps he would have incorporated the architectural sense of Ramírez’s drawings into his structures and paintings, providing Ramírez greater recognition during his life. But none of this happened. Despite the countless possible scenarios, what marked Ramírez’s life and work was his arrest and subsequent confinement in mental health institutions. Installation view of Martín Ramírez: His Life in Pictures, Another Interpretation. Institute of Contemporary Art, Los Angeles (ICA LA), September 9–December 31, 2017. Photo: Brian Forrest. This context led Ramírez’s work to be defined as outsider art when it started to gain popularity in the late 1960s. Outsider art is a subcategory of autodidactic art, but it describes art with a specific relationship to psychopathology. As it is formulated beyond the limits of art institutions, the concept of outsider art is relatively new. The term was first developed in Morgenthaler’s study A Mental Patient as Artist: Adolf Wölfi (1921) and Hans Prinzhorn’s Artistry of the Mentally Ill (1922). 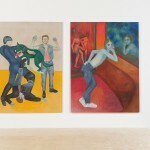 Morgenthaler and Prinzhorn were familiar with the concerns of the avant-garde in the early twentieth century and claimed that the work they were studying was in line with certain concerns of these historic movements. During the second half of the twentieth century, the artist Jean Dubuffet would continue this radical appreciation of outsider art using the term art brut, which he defined as a practice that is passionately personal and posits a social challenge. The valorization of this type of art during the 1960s and 1970s (in 1972, the critic Roger Cardinal systematized the ideas of Buffet in his book Outsider Art) resonated with the era’s spirit of nonconformity. It’s no surprise that Ramírez’s work gained visibility during this period with the support of two artists: Gladys Nilsson and Jim Nutt. However, questioning the legitimacy of Ramírez’s diagnosis also problematizes the appreciation of his work as a categorical example of outsider art. If we stop associating him with this context, his drawings could be seen as autodidactic representations of known figures and elements that rely on certain line variations reminiscent of local and vernacular ornamentation– able to evoke The drawing method of Adolfo Best Maugard. But this categorization would also fail to fully define his work. 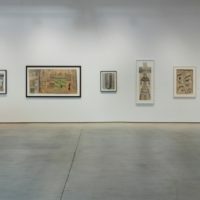 Some of his pieces feature gestures and visual solutions – such as accumulation, repetition, and a sense of horror vacui – that are common in the works of artists who are representative of outsider art. A piece like Untitled No. 79 (Arches) demonstrates Ramírez’s obsessive repetition and extension, as the profusion of ornate columns and arches in the drawing provokes a hypnotic effect. Between Outsider and self-taught art, the work of Martín Ramírez is difficult to categorize. Untitled (Male figure, Bull, Horse, and Rider), n.d. Image courtesy of Tom VanEynde/ Collection of Jim Nutt and Gladys Nilsson. Another issue that problematizes the simple categorization of Martín Ramírez’s work is its transnationality. 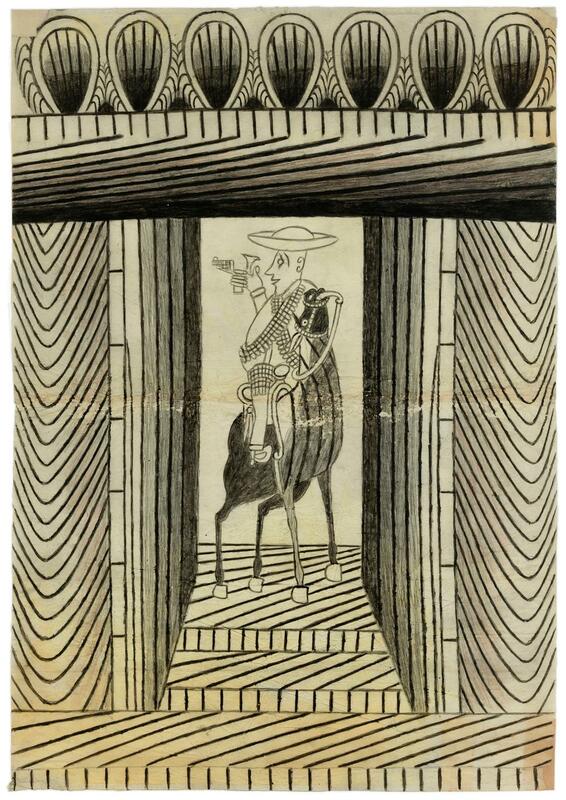 Ramírez’ drawings are filled with imagery that directly relates to his life in Mexico, such as charros, but his perspective is also uniquely American. 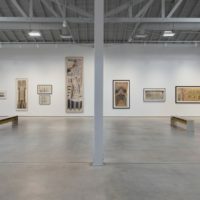 Rather than comparing a rural Mexico to an urbanized, motorized United States – a reoccurring cliché in commentary on his work – his imagery is the product of a perspective he developed by reading a range of publications while institutionalized. The influence of his reading can be seen in the colorful cars drawn in Untitled (ca. 1950), which appear to depict the latest car models from the period, or more clearly in Untitled (Male figure, Bull, Horse and Rider) (n.d.), a piece that includes an advertisement for toothache medication. This piece incorporates a drawing of a charro riding a horse, a bull, and the advertisement featuring an Anglo-Saxon man grimacing with pain and touching a hand to his face. These peculiar juxtapositions speak to the transnational character of Ramírez’s work, although they have also been interpreted as surrealist, just as Octavio Paz did in his classic essay on the artist he wrote for the catalog of the exhibition Martín Ramírez: Pintor mexicano (1885-1960) presented at Centro Cultural Arte Contemporáneo of Mexico City in 1989. Although Ramírez’s work eschews easy categorization, there is one aspect of it that cannot be ignored. As Josh Kun states in the exhibition catalog: “”In all of these labels, what has been lost is Ramírez’s status as an immigrant laborer who became an immigrant detainee diagnosed with dementia; what has been lost is that Ramírez made art from the position of being unfree.” Seclusion, confinement, and isolation are recurrent themes in his work. 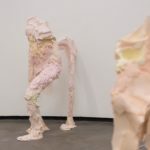 While many academics have considered these themes to be peripheral, there is a strong sense of seclusion and confinement in the frames Ramírez draws around his figures. Charros, saints, virgins, animals, and other characters appear to be imprisoned within the distinct perspective games that frame them. Courtyard (c. 1953) (not included in the exhibition) is particularly expressive in this respect. In the drawing, a character –Ramírez perhaps – is framed by a structure reminiscent of a ward in an architectural surveillance system. Beyond it, there is a group of animals who also appear bound by a frame ensuring their confinement in a world without escape. Untitled (Man at Desk) (ca. 1950-57) can be seen in the same way as a man is seated within a frame, in front of a table and with a pencil at hand. It is a scene that possibly evokes Ramírez’s everyday life in confinement. Above his head, a train passes, as if floating in space. As if illustrating an imaginary scene, the artist draws the man at a desk anchored to the floor while the train moves freely through a plane that does not correspond to his reality. Untitled (Man at Desk), c. 1960 – 1963. Gouache and graphite on pieced paper, 24.5 x 14.75 in. These examples can be associated with a certain intentionality found in Ramírez’s work addressed in the exhibition catalog by Rubén Gallo. With additional written contributions from Jamillah James, Gladys Nilsson, Jim Nutt, Mark Pascale, and Harriet Stratis, the catalog offers diverse, and at times contradictory perspectives on the Mexican artist which broaden the discussion of his production and offer an important contribution to the study of his work. 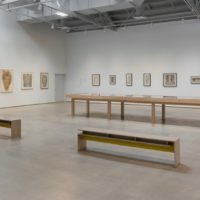 The exhibition, on the other hand, besides presenting Untitled (Scroll), works are grouped together based on recurrent motifs and figures such as characters and animals, tunnels, trains and vehicles, architecture and landscape, and abstractions. This arrangement is, to a certain extent, contradictory to the writing in the catalog that seeks to problematize simple categorization. 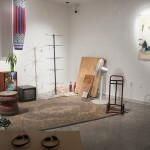 However, it also allows viewers to see the variations in Ramirez’s work in the context of recurrent imagery. If the catalog complicates our understanding of the artist’s biography and production, the exhibition offers a vision of the multiplicity and variations present in his artwork. Daniel Garza Usabiaga holds a Ph.D. in History and Theory of Art from the University of Essex, and postdoctoral studies at the Institute of Aesthetic Research of the National Autonomous University of Mexico (UNAM). He lives and works in Mexico City. Existe una fotografía de Juan O´Gorman, tomada por Esther McCoy alrededor de 1958, durante su visita a las Torres Watts en Los Ángeles. En esta imagen, el arquitecto mexicano observa, levantando el rostro, esta construcción edificada por Simon Rodia entre 1921 y 1954. Rodia fue un inmigrante italiano que se estableció en los Estados Unidos en 1895 a la edad de 15 años. Sin contar con una educación artística o arquitectónica, decidió edificar una construcción singular. Sin ningún fin en particular, Rodia construyó las siete estructuras que dan forma a sus torres (bajo el título Nuestro pueblo) utilizando concreto, varilla, tela de gallinero y un sinfín de objetos encontrados desde fragmentos de cerámica hasta tapas de refrescos. O´Gorman apreciaba el trabajo de Rodia así como de otros constructores o artistas con edificaciones o proyectos similares, como el francés Ferdinand Cheval. El recubrimiento pétreo de su casa/estudio en avenida San Jerónimo y muchas de sus pinturas “fantásticas” son, en parte, un homenaje a estos autores. Juan O’Gorman en las Torres Watts, circa 1958 / Esther McCoy, fotógrafa. Documentos de Esther McCoy, 1876-1990, segmento, 1938-1989. Archivos de Arte Estadounidense, Instituto Smithsonian. Justo cuando O´Gorman visitaba las Torres Watts, el mexicano Martín Ramírez vivía en California, confinado en un hospital psiquiátrico. Ramírez nació en Jalisco el mismo año que Rodia emigró a los Estados Unidos. Como si siguiera al italiano, Ramírez también cruzó la frontera y se estableció en Los Ángeles. En 1940, mientras el segundo construía de manera silenciosa su edificación, el mexicano fue aprehendido por policías en Pershing Square e internado en el Hospital del Estado en Stockton (donde permaneció hasta 1948) y posteriormente en Auburn (donde vivió hasta que falleció en 1963). Estudios recientes demuestran la falta de claridad y precisión en el proceso de diagnóstico de Ramírez; para algunos académicos, más que un asunto de salud psíquica, fue una medida de confinamiento para un residente ilegal. Alentado por el profesor de arte y psicología de la Universidad de Sacramento, Tarmo Pasto, Ramírez dedicó gran parte de su tiempo en reclusión a dibujar. A su muerte dejó decenas de dibujos con un particular estilo que hoy es reconocido como distintivamente suyo. 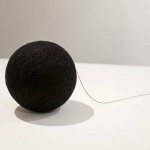 La exposición Martín Ramírez. His Life in Pictures, Another Interpretation presentada en el ICA de Los Ángeles como parte de la iniciativa del Instituto Getty Pacific Standard Time: Los Ángeles / Latinoamérica, presenta media centena de piezas de este autor de origen mexicano. 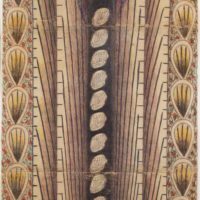 Como parte de esta exposición se restauró Untitled (Scroll) (ca. 1950), un dibujo de más de dos metros de largo que se exhibe por primera vez. Esta pieza, dispuesta en una gran vitrina al centro de la muestra, condensa y presenta las distintas soluciones y rasgos que se pueden encontrar en el resto de las obras de Ramírez que se exhiben en el mismo sitio. De especial interés es el método con el que Ramírez articuló esta gran superficie, uniendo múltiples fragmentos de distintos papeles (algunos operando a la manera de collage) con pegamento o saliva. Esta forma de ensamblaje puede recordar el trabajo de Rodia quien también recolectó y se valió de fragmentos para expandir continuamente su construcción. Aunque Untitled (Scroll) destaca por su gran dimensión, Ramírez realizó varias obras de gran formato como Untitled (ca. 1950) de aproximadamente 3.60 x 1 m y en exhibición, o Untitled No. 79 (Arches) (ca. 1960-63) de 183 x 61 cms. Vistas de instalación de Martín Ramírez: His Life in Pictures, Another Interpretation. Institute of Contemporary Art, Los Angeles (ICA LA), 9 de septiembre al 31 de diciembre, 2017. Fotografía por Brian Forrest. En su ensayo para el catálogo de esta exposición, James Oles aborda la cuestión de las circunstancias de vida de Martín Ramírez y la forma en que determinaron la percepción de su trabajo. Si Martín Ramírez hubiera desarrollado su práctica en México, por ejemplo, no se entendería como se hace hoy. 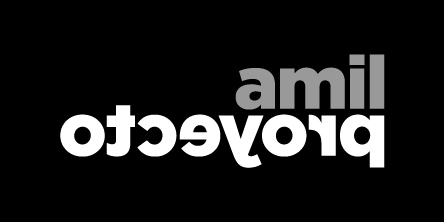 Su producción autodidacta sería vista, si la fortuna le hubiera sonreído y hubiera contado con visibilidad, como expresión de una creatividad innata del mexicano, algo que sucedió con Mardonio Magaña o los primeros maestros de arte popular durante la época postrevolucionaria. Algo similar habría sucedido si hubiera sido un ciudadano norteamericano. En Estados Unidos también existió un aprecio institucional hacia el arte naive y folk, tal y como lo demuestra la popularidad del trabajo de Morris Hirshfield o la exposición de 1939 Contemporary Unknown American Painters del MoMA. Si Ramírez, siendo un trabajador migrante, se hubiera topado con alguien en California como José Clemente Orozco, tal y como le sucedió a José Chávez Morado, quizá pudo haber ingresado a una universidad, estudiar arte y regresar a su país como un artista formado. Si O’Gorman hubiera conocido su trabajo, quizá hubiera incorporado el sentido arquitectónico de sus dibujos en sus construcciones o pinturas, dándole cierto reconocimiento. No obstante, nada de esto sucedió. Sin importar todos los escenarios posibles, lo que marcó la vida y obra de Ramírez fue su aprehensión por la policía y su confinamiento en instituciones de salud mental. Esta condición, situó el trabajo de Ramírez desde que se empezó a popularizar a finales de los sesenta dentro de la categoría de Outsider art. Este término, aunque cabe dentro de la noción de arte-autodidacta, difiere en su relación con la psicopatología. La formulación de este arte que se encuentra fuera de los márgenes de la institución es relativamente reciente. Inició con los estudios de Walter Morgenthaler, A Mental Patient as Artist: Adolf Wölfi (1921) y de Hans Prinzhorn, Artistry of the Mentally Ill (1922). Morgenthaler y Prinzhorn se encontraban familiarizados con asuntos de arte de vanguardia y ubicaron dichos trabajos prácticamente en línea con ciertas cuestiones de estos movimientos históricos. 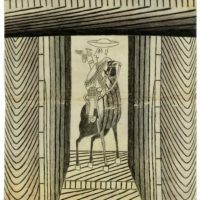 Durante la segunda mitad del siglo veinte, el artista Jean Dubuffet continuaría con esta apreciación radical del Outsider art mediante su término de Art Brut, una práctica que fue posicionada como pasionalmente personal y socialmente desafiante. La valorización de este tipo de arte durante los años sesenta y setenta (el libro que sistematiza las ideas de Dubuffet, Outsider Art de Roger Cardinal, se publicó en 1972) resuena con el espíritu de inconformidad de esa época. No sorprende, que el trabajo de Ramírez haya alcanzado su notoriedad durante esos mismos años y que sus promotores hayan sido, además, dos artistas: Jim Nutt y Gladys Nilsson. No obstante, el cuestionamiento al diagnóstico de Ramírez debilita la apreciación de su trabajo como un ejemplo categórico de Outsider art. Al no relacionarlo con dicho término, los dibujos de Ramírez podrían verse como una manifestación autodidacta que representa figuras y elementos conocidos y que utiliza ciertas variaciones de líneas que recuerdan a la ornamentación local y vernácula – capaz de evocar El método de dibujo de Adolfo Best Maugard. No obstante, esta categorización tampoco encaja del todo con su trabajo. 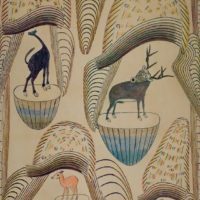 Algunas de sus piezas, por ejemplo, presentan algunos gestos y soluciones – como la acumulación, la repetición y un sentido de horror vacui – que son comunes entre artistas representativos del Outsider art. Una pieza como Untitled No. 79 (Arches) sirve para ejemplificar esto con su obsesiva repetición y extensión, al grado que la profusión de columnas y arcos en el dibujo, y su ornamentación, adquiere cierto efecto hipnótico. Entre arte autodidacta y Outsider, el trabajo de Martín Ramírez resulta difícil de categorizar. Untitled (Male figure, Bull, Horse and Rider), s,f. 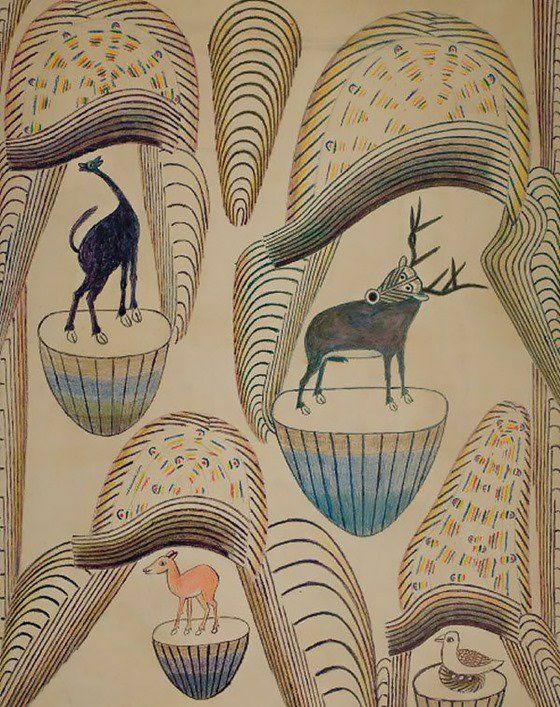 Imagen cortesía de Tom VanEynde/ Colección de Jim Nutt y Gladys Nilsson. Otra cuestión que problematiza simples categorizaciones del trabajo de Ramírez es su carácter transnacional. El artista integra a sus obras dibujos que están directamente relacionados con su vida en México, como los charros, pero también un imaginario propio de Estados Unidos. Esto va más allá de la comparación y contraste entre un México rural y un Estados Unidos urbanizado y motorizado – especie de cliché que se formula al hablar de su obra – sino que compete un imaginario particular con el cual se familiarizó a través de distintas publicaciones a las que tenía acceso mientras estaba recluido. Esto es apreciable en los automóviles de colores dibujados en Untitled (ca. 1950) y que parecen ser los últimos modelos de esos años o, de manera más evidente, en Untitled (Male figure, Bull, Horse and Rider) (s/f), una pieza que incluye en el dibujo un recorte de un anuncio publicitario de un medicamento para el dolor de muelas. De esta manera, está obra integra el dibujo de un charro montando a caballo y un toro junto a la ilustración publicitaria de hombre anglo-sajón con expresión de dolor y tocándose la cara con una mano. Estas peculiares yuxtaposiciones hablan del carácter transnacional de la obra de Ramírez aunque también han sido asociadas con el surrealismo, tal y como lo hizo Octavio Paz en su clásico ensayo sobre el artista que escribió para el catálogo de Martín Ramírez: Pintor mexicano (1885-1960) presentada en el Centro Cultural Arte Contemporáneo de la Ciudad de México en 1989. Si el trabajo de Ramírez desafía categorizaciones puntuales hay un aspecto al cual no puede escapar. Josh Kun menciona este punto en el catálogo de la muestra: “En todas las etiquetas [aplicadas a su obra], lo que se ha perdido es el estatus de Ramírez como un trabajador inmigrante que fue detenido como trabajador ilegal y diagnosticado con demencia; lo que no se ha contemplado es que Ramírez hizo arte desde su posición carente de libertad”. La reclusión, el confinamiento y la aislación son recurrentes en sus obras. Aunque muchos académicos los han calificado como proscenios, existe un fuerte carácter de reclusión y confinamiento en los marcos que Ramírez utiliza para posicionar a los distintos personajes que aparecen en sus dibujos. Charros, santos y vírgenes, animales y distintos personajes parecen estar aprisionados dentro de estos juegos de perspectivas acentuadas. Courtyard (c. 1953) – no incluida en la exposición – es particularmente expresivo en este respecto. Un personaje, quizá Ramírez, se encuentra enmarcado por una construcción que fácilmente se puede relacionar con una crujía dentro de un sistema arquitectónico de vigilancia. Afuera de este perímetro se encuentran un grupo de animales que, sin embargo, tampoco parecen poder escapar de un mundo que, con un marco, asegura su confinamiento. Untitled (Man at Desk) (ca. 1950-77), puede ser visto desde la misma óptica al presentar dentro de un marco (o proscenio) a un hombre sentado, frente a una mesa y con un lápiz en la mano; una escena que podría verse en relación a la cotidianidad de Ramírez durante su confinamiento. Sobre su cabeza, pasa un tren, como si flotara en el espacio. Como si fuese la ilustración de una escena imaginativa, el artista coloca al hombre del escritorio anclado al piso mientras que el tren se mueve libremente en otro plano que no corresponde a su realidad. 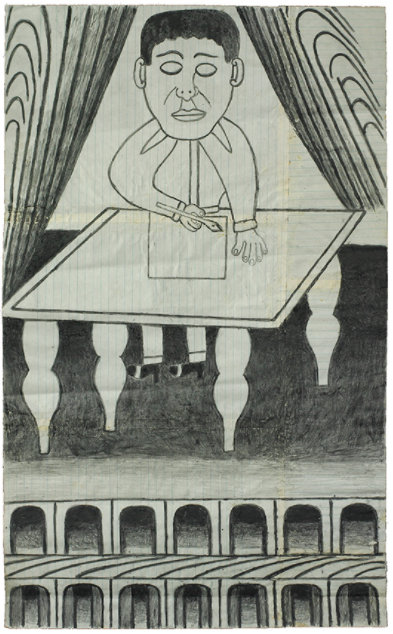 Untitled (Man at Desk), c. 1960 – 1963. Gouache y grafito sobre trozo de papel, 24.5 x 14.75 in. 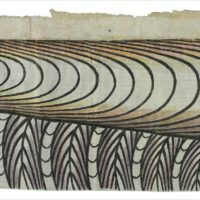 Estos ejemplos se pueden asociar a cierta intencionalidad presente en las obras de Ramírez y que en el catálogo es abordada por Rubén Gallo que, junto a los autores ya mencionados y Jamillah James, Mark Pascale, Harriet Stratis, Nutt y Nilsson, ofrecen distintas y, en ocasiones, contradictorias perspectivas sobre el artista mexicano, mismas que amplían el debate alrededor de su producción y ofrecen una contribución importante para su reflexión y estudio. 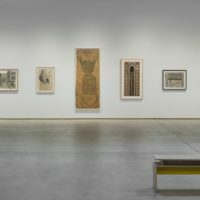 La exposición, por su parte, además de presentar Untitled (Scroll), agrupa el resto de las obras a través de motivos y figuras recurrentes: personajes y animales, túneles, trenes y vehículos, arquitectura y paisaje, abstracciones. Este arreglo se mueve, hasta cierto punto, en contracorriente a los contenidos del catálogo que constantemente problematizan categorías simples. No obstante, el arreglo de las piezas permite ver la variación existente en el trabajo de Ramírez aún dentro de elementos reiterativos. Si el catálogo ubica al artista y su producción en su complejidad, la muestra expone la multiplicidad y variaciones de sus soluciones plásticas. Daniel Garza Usabiaga es Doctor en Historia y Teoría del Arte por la Universidad de Essex, realizó estudios Posdoctorales en el Instituto de Investigaciones Estéticas de la Universidad Nacional Autónoma de México (UNAM). Vive y trabaja en la Ciudad de México.